Nine years ago Fathe Tesfamariam’s family arrived at Auckland’s Mangere Refugee Resettlement Centre from Sudan. He was 15-years-old and his first memories were of a welcoming place filled with music and television in a language he couldn’t understand. It was in high school he started learning English and found a love of performing and decided to pursue an acting career. Now he’s performing at Mangere Arts Centre in In Transit, a show about African people’s journeys to New Zealand. “It’s pretty fun and it’s very exciting for me to be doing my first African show,” Tesfamariam says. 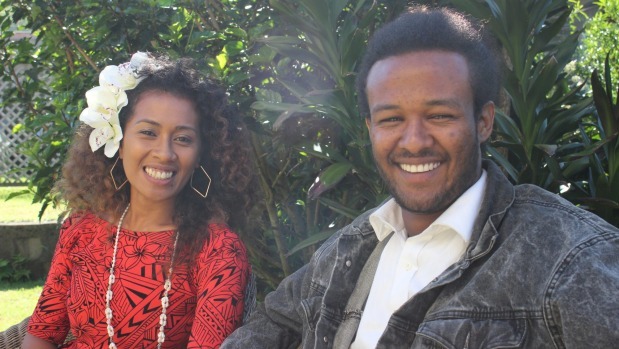 While he says he hasn’t asked his mum about her story from Ethiopia to Sudan to New Zealand, he’s hopeful she will enjoy the show and see him perform. “My Mum used to say to me that my education was more important than acting and drama and she didn’t take it seriously but for me it was really serious. In Transit is a new show written by Wanjiku Sanderson about African refugees and immigrants finding their place in a new country. With actors, dancers and musicians from Africa, the Pacific Islands, and New Zealand, the show features traditional African songs, dancing, and storytelling. Tesfamariam plays Ahmed in the show, alongside Sonaalofa Eliesa, who plays Maisha, a Sudanese character. Eliesa’s family emigrated to New Zealand from Tuvalu 18 years ago. Like Tesfamariam, she couldn’t speak English but had a passion for dancing, despite her parents telling her it wouldn’t put food on the table. It’s through In Transit she’s come to understand more about people’s struggles, including her parents, in coming to New Zealand. “I had no understanding. Where we come from there was no war, no major drama, no chaos, we only came here for a better future,” Eliesa says. In Transit runs from May 4 to 13 at Mangere Arts Centre. Go to Eventfinda for tickets. Next Post:The Bachelor Recap: Who will Zac choose?